Slice the eggs in half, lengthwise. With a teaspoon, carefully remove the yolks and put them in a deep bowl to mix them with the rest of the stuffing ingredients later. Set aside the whites to stuff them. Heat a medium skillet over medium high heat. Put in the bacon and cook until crispy. Remove from the heat and drain on paper towels. With your hands, crumble into small pieces. Set aside. Add the mayo, mustard, caper juice, pepper and paprika to the container with the cooked yolks. Mix well with a fork. In a medium bowl, mix the cut avocados with lime juice to prevent them from turning brown. Set aside. With a tablespoon or pastry bag, fill the egg halves with the yolk mixture. On top of each, put a piece of avocado, a few pieces of bacon and a caper. Put the filled eggs in a covered container and refrigerate for three hours so that the mixture becomes firm. Before serving, if you want, sprinkle with a bit of freshly ground pepper and paprika. For filled eggs fit for a contest, use a pastry bag to stuff them. To add a spicy touch to your deviled eggs, add to the filling a few drops of hot sauce to taste. If you prepare the recipe during lent you can leave out the bacon. Martha Salas Around Easter, the tradition of looking for hidden eggs, painting them and, of course, preparing stuffed eggs in thousands of ways is the most fun part. My daughters' favorite recipe is deviled eggs with bacon and avocado. When I was little, my mom used to fill them with a mixture of mayo, mustard and ground ham—really delicious. But since I always like being inventive and creating new recipes, today I have a new one for you. My daughters help me in the kitchen during their time off. 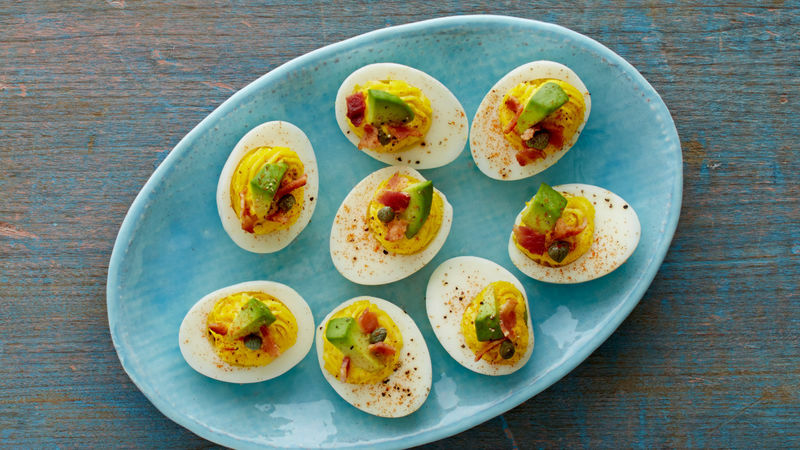 At any time of the year, we make deviled eggs with a crunchy touch of bacon and pieces of avocado for that special touch. Besides being decorative, they're original and everyone likes them; they're great for picnics, celebrations or just to satisfy a craving!